"So...you're Richard Benson, huh? The many they call the Avenger?" "Avenger" is a term bandied about quite a bit these days when referring to superheroes. The thing is, not every Avenger is part of a team or has a hidden power. Some of them are just really good detectives, as is the case with Richard Benson in Justice: The First Avenger #1 from Dynamite Entertainment. The issue is written by Mark Waid, illustrated by Ronilson Freire, colored by Marco Lesko and lettered by Troy Peteri. Meet Richard Henry Benson - the Avenger! His pallid features forever deadened by a criminal act, he is the ultimate master of disguise and uses his skills to mete out retribution to those who would prey on the innocent! But can even Benson triumph over an Invisible Man...? 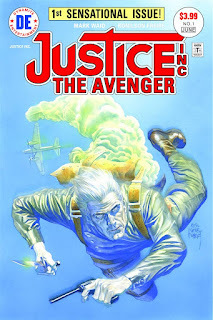 The Avenger was created in a time when Doc Savage and the Shadow were the prevalent superheroes, largely relying on their intelligence and resources to solve mysteries and fight crime. The Avenger is really no different and Waid captures that mantra rather flawlessly in Justice: The First Avenger #1. The open of the book boasts a scenario that introduces the reader to the Avenger and his team as they're right in the thick of things, as Waid's dialogue features witty banter flying between characters that characterizes them as a team well. The bulk of the issue is spent setting up the remainder of the series, with Waid giving the characters a somewhat supernatural case to contend with. Waid paces the book well despite the two "parts" of the issue, offering one coherent tale that moves well. The characters in Justice: The First Avenger #1 all feel distinct and easy to pick out amongst the others, all while Freire maintains the pulp sensibilities of the property. 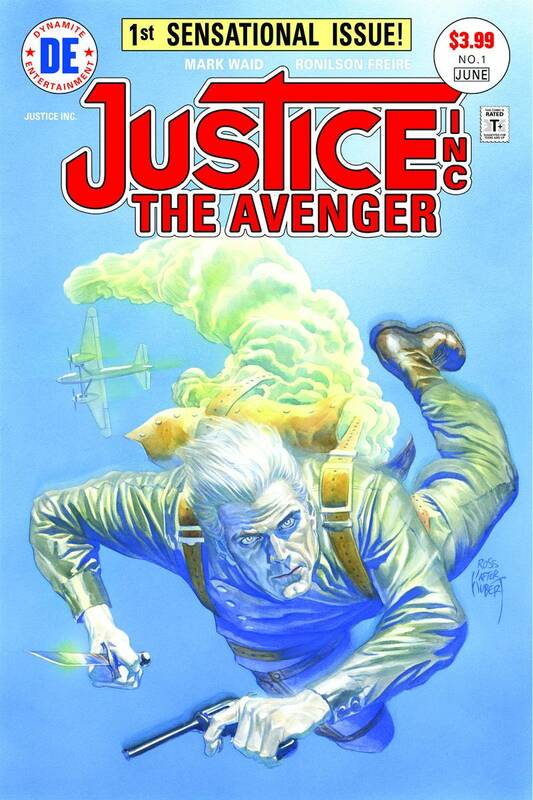 The first appearance of Benson as the Avenger dominates the page. Freire illustrates him with a stature that's imposing and radiant, further bolstered by Lesko's pale colors for emphasis on his condition. The appearance of the Transparent Man is even more striking than that of The Avenger, as Freire's rendering of him lies at the intersection of human anatomy and terrifying. Lesko does some great work with the colors throughout, often tinting pages to match their environments. Justice: The First Avenger #1 is an interesting first issue that sets the stage for an even grander spectacle. The Avenger is a fearless hero who dives into the action headstrong and confident he'll emerge triumphant, owing to his intellect and tactical planning capabilities. Waid captures the essence of the character well and presents a camaraderie amongst his peers that is truly solid. Freire's art is a good match for the book and pays homage to a different era of heroes and stories. Justice: The First Avenger #1 is a great throwback to another era and fans of those types of books will definitely want to get on board. Justice: The First Avenger #1 is in stores now.